SHOP: Handmade in Vermont, Wallingford VT. 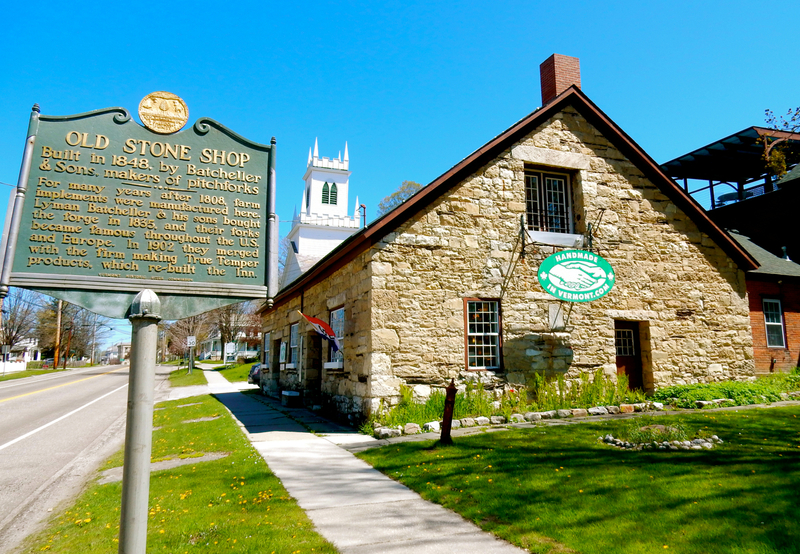 The last thing you’d expect before walking through the door of this historic stone building, America’s first pitchfork factory built in 1848, is an assemblage of contemporary home décor, crafts and lighting. It’s quite the surprise. As the largest Hubbarton Forge dealer, Handmade In Vermont features gorgeous lighting fixtures and other home accessories and furniture hand-forged in Vermont. As famous as he was for his magazine illustrations, however, Rockwell’s ads for Ticonderoga Pencils, Mobil Oil, Beacon Blankets and other products were just as homespun. 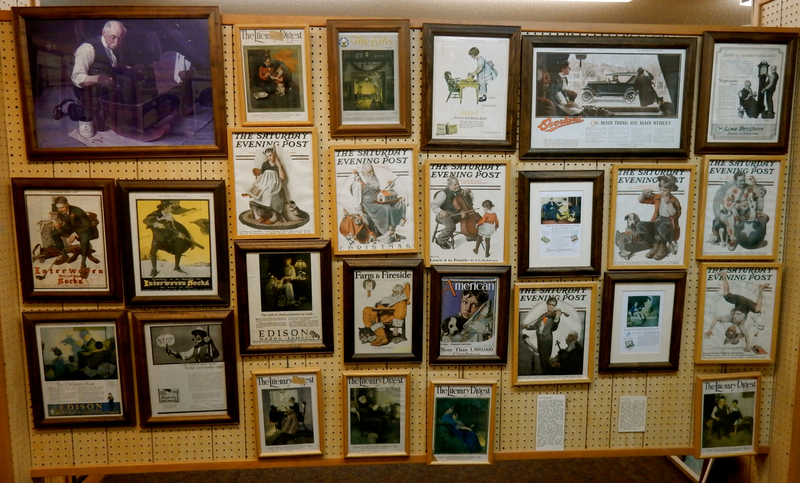 You can purchase any number of original Saturday Evening Post magazine covers (some with address label still attached) for just $35 at the shop next to the museum. 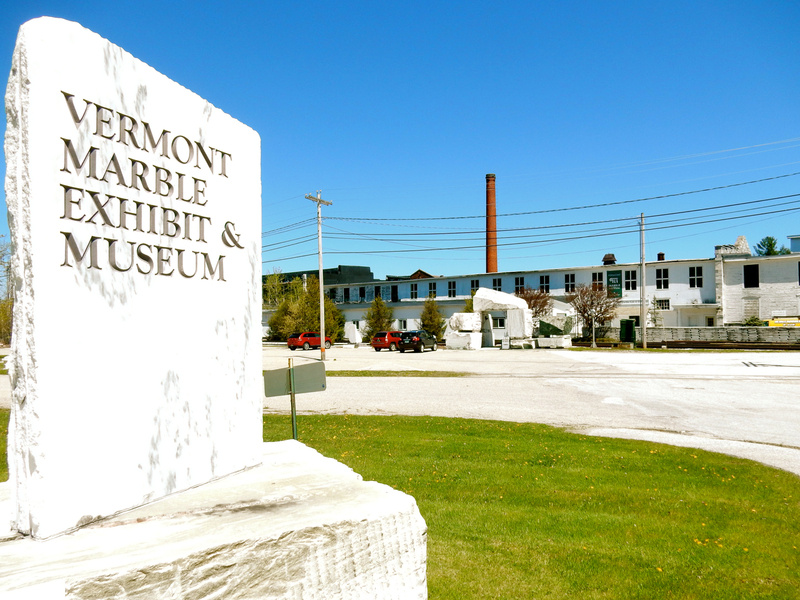 TOUR: Vermont Marble Museum, Proctor VT. New Hampshire might have its granite, but Vermont has marble: Beautiful, white, veined stone. Not all iconic national monuments were made of marble quarried in Vermont, however. The Tomb of the Unknown Soldier in Arlington Cemetery was quarried in Colorado by the Vermont Marble Company, and sent to Vermont to be carved. 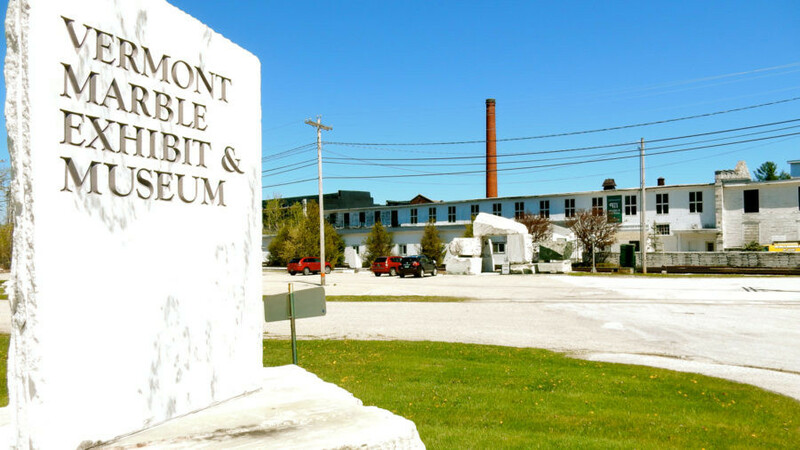 The museum is housed inside the company’s industrial building, with a gleaming white marble plaza, and a tour provides you with information about geology, history of the marble industry, and an inspection of each past US President carved in bas-relief in the stately Hall of Presidents. 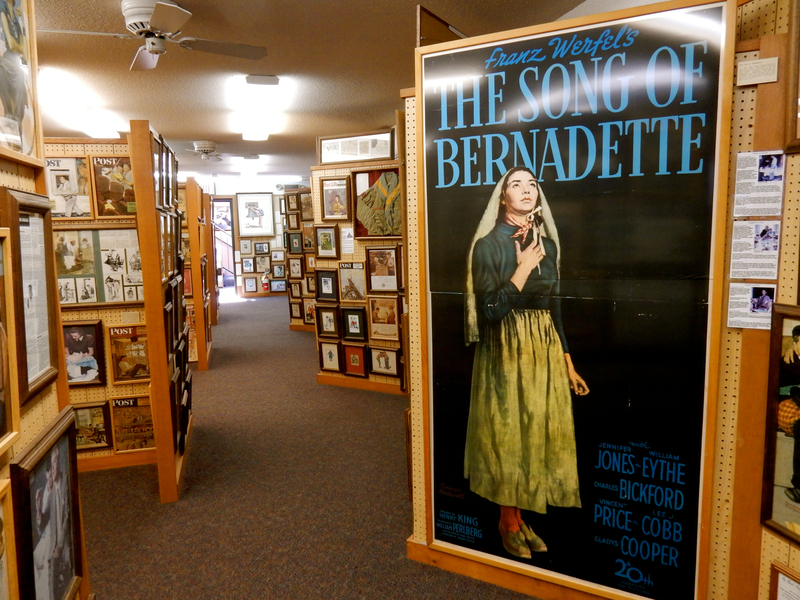 Open mid-May to October, daily 10-5. $9 adults, $4 kids. 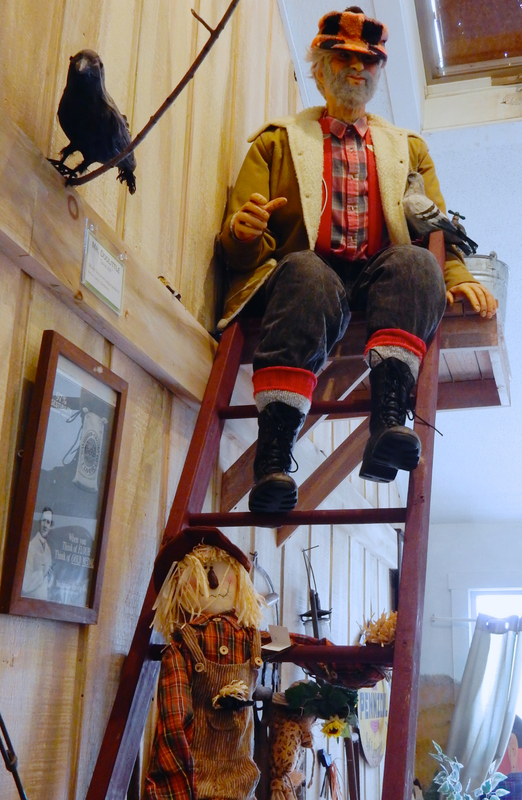 Enter the Museum area, and a motion sensor activates a robotic farmer, sitting atop a ladder, who pontificates about life on the farm in late winter. Continue on to see, antique buckets, sugaring kettles, and other implements of the trade. Push a button in front of each diorama to hear sugar-makers, Mr. or Mrs. Hitchcock, comment on what you are seeing. 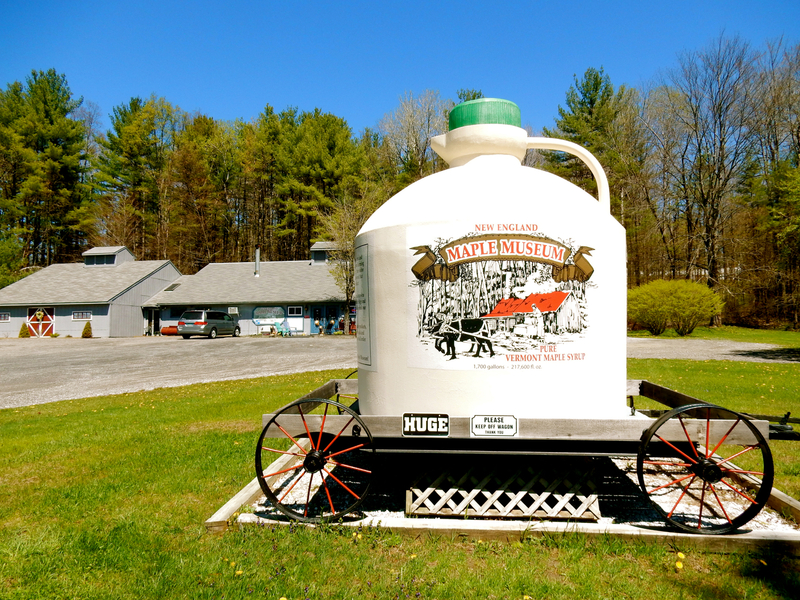 To supplement income, farmers made maple syrup in the off-season, and despite its romantic allure, it was hard work. 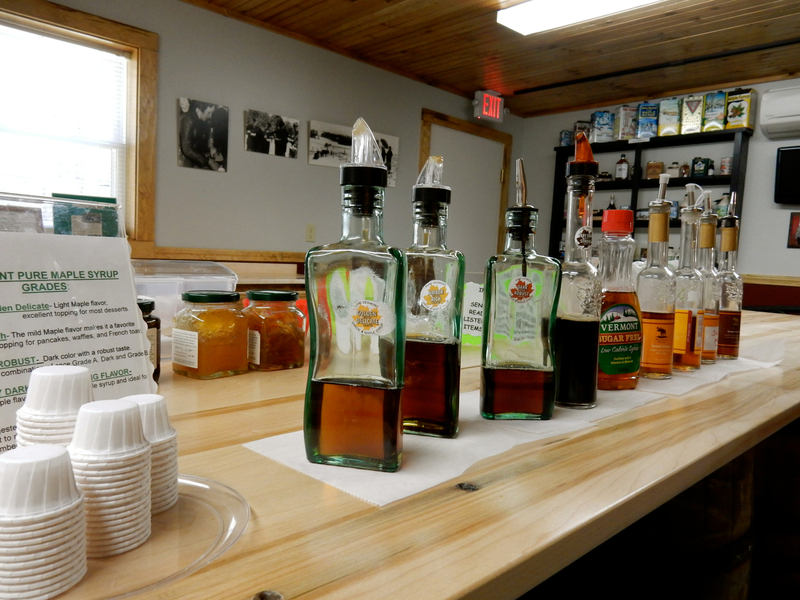 While Farmer H. called sugaring “a labor of love,” waxing lyrical about it being his favorite thing to do, the Mrs., sounding tired and annoyed, described it as “the hardest work on the farm, hot and boring.” And the odor? At first, heavenly, but towards the end of the season, “it smells like socks.” And on that note, you are invited to try out as many samples as you’d like. Open daily 10-4 or 5 depending on time of year, $5 adults, $1 kids. DO: Spa Treatment at Mountain Top Spa, Chittenden VT. 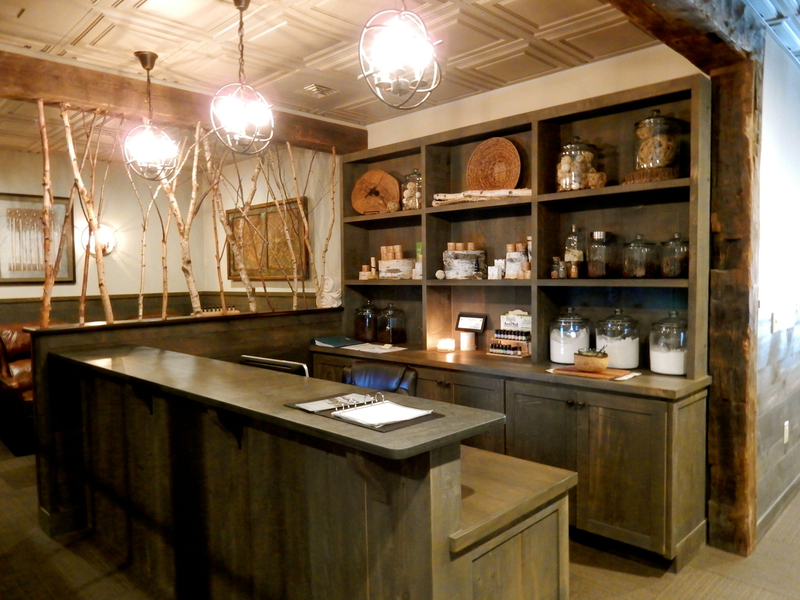 Even if you don’t stay there, plan a treatment at the brand new, barn-chic Spa. Treatment rooms, for facials, body wraps and all kinds of massage, feature stone tile showers. Participate in Yoga, Guided Meditation, X-Country Skiing and Snowshoeing in season, and much more. If your time is limited, revel in the mountain and lake views while soaking your feet in hammered copper bowls filled with warm water and soothing salts. 50-min. massage and treatments from $110-$135. SHOP: Downtown Rutland has some cool and funky shops, including the indie Phoenix Bookstore, and for uncommon clothing, Raw Honey, Fruition and Slightly Off-Center. SKI: Killington and Pico are both close by, and the reason most people visit here in winter. But if you are not a skier, use the above ideas to explore. EAT: Roots, Rutland VT. I’ve never had Chicken Thighs quite like these: tasty, tender and glazed in Vermont honey-butter ($20). I’d return for these delectable treats alone, but this popular farm-to-fork eatery is also known for its craft cocktails, house-made pastas ($18), Emu Meatloaf ($19), and a Signature Cheese Fondue ($10) incorporating local milk and cheese. 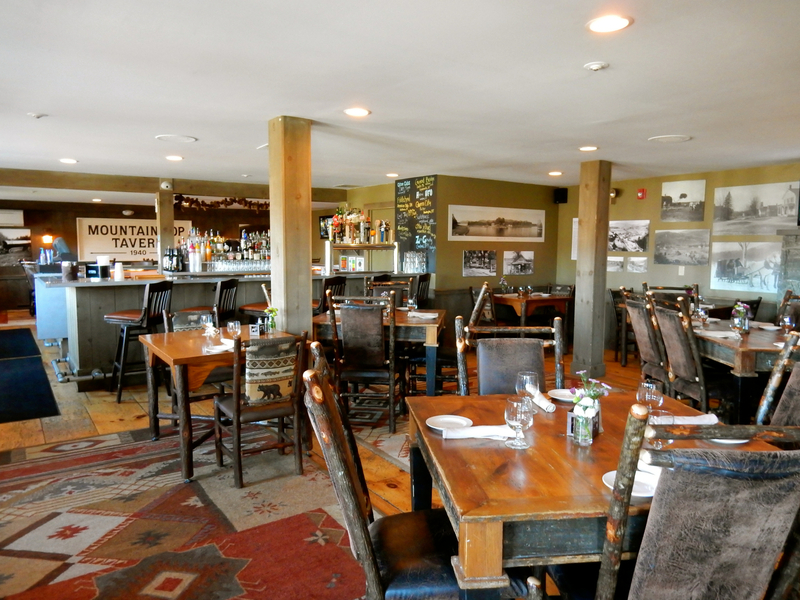 EAT: Red Clover Inn, Mendon VT. A destination restaurant at a stunning country inn (see below in “Where to Stay”), Red Clover is as innovative as it is excellent. You’ll find Escargot atop a bed of seaweed, Duck pan-roasted with pomegranate demi-glaze, and other remarkable dishes on a menu that changes seasonally. 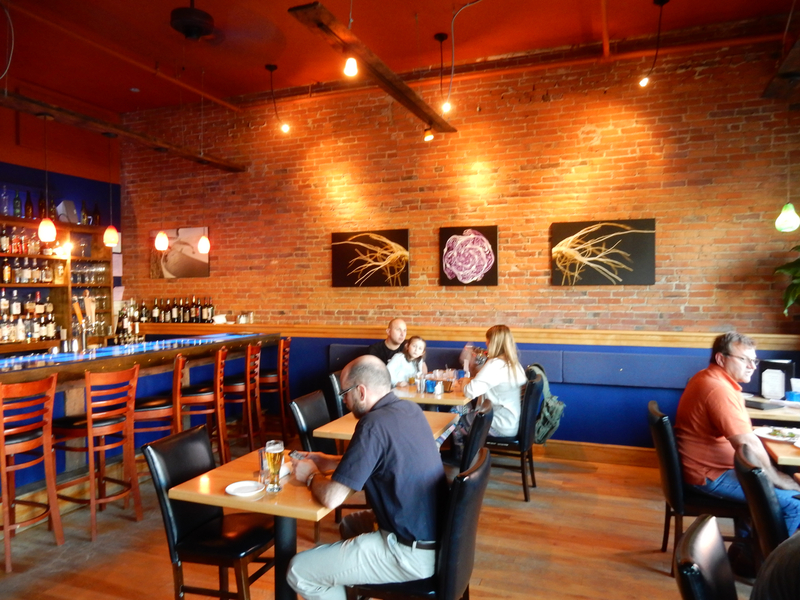 EAT: Mountain Top Inn and Resort, Chittenden VT. Another destination restaurant, this is less experimental, but excels in Vermont Cheese (order a selection from the Cheese Board) and craft beer (12 local Craft Beers on tap). 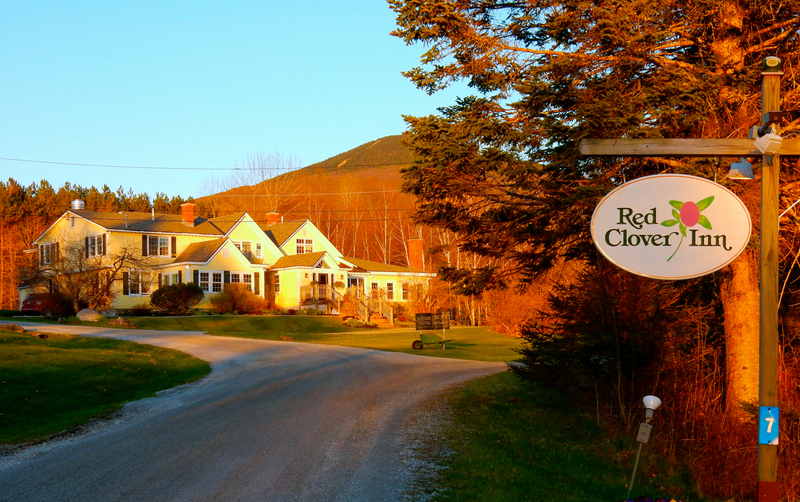 STAY: Red Clover Inn, Mendon, Vermont. Just a few miles from downtown Rutland, this attractive yellow inn is fine enough for the local Chamber of Commerce to hold a monthly soiree, friendly enough to feel like family, and pretty enough to impress a jaded travel writer. 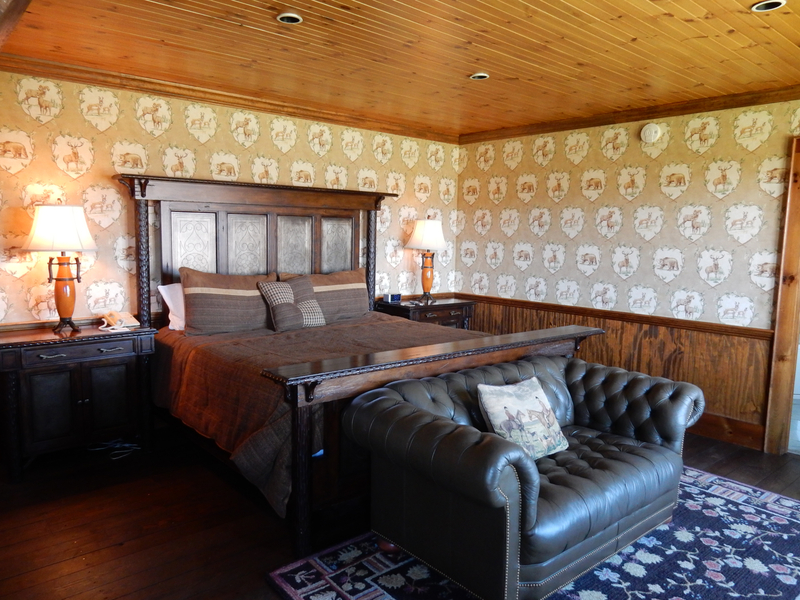 About 15 minutes from Killington, many consider this to be one of the top B&B’s in central Vermont. This Inn is a Getaway Maven’s Favorite, and covered on its own – HERE. Rooms and suites from $125 – $350 per night include gourmet hot breakfast, parking, wi-fi, popcorn. 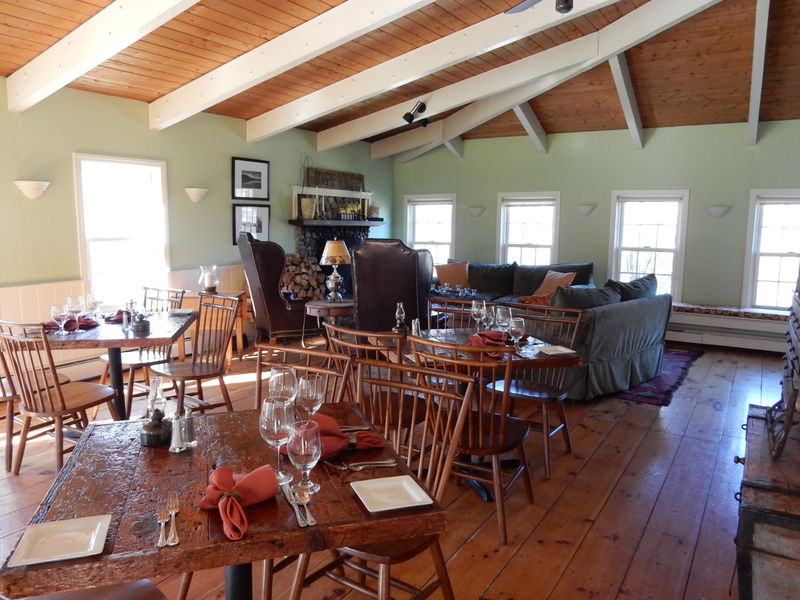 STAY: Mountain Top Inn Resort, Chittenden. This high-end, newly renovated resort high on a hill has fantastic views of the Chittenden Reservoir and mountains. Also an Equestrian Center with miles of trails on 350 acres for horses (or x-country skiing), you can trailer your horse here, board it (limited stalls) and stay in luxury yourself. Ask for a themed room, like the woodsy Adirondack or Elk Cove, or book a family cottage or rustic cabin for larger families. The Spa is new, enticing and out of this world (see above). Rooms from $275 per night (plus 15% Resort Fee and 9% VT Tax) include morning coffee, afternoon refreshments, us of hot tubs, pool, x-country ski trails, parking, wifi. STAY: HandMade In Vermont Housing, Wallingford, Vermont. According to the owner, these two wonderfully renovated homes are “tricked out for people traveling with elderly parents and dogs.” And lots of kids. About 15 minutes from Okemo and Killington, each of two homes can sleep up to ten people. $300 per night for each house.